In the 1940s, American oil workers in Saudi Arabia stumbled across ruins in the desert. 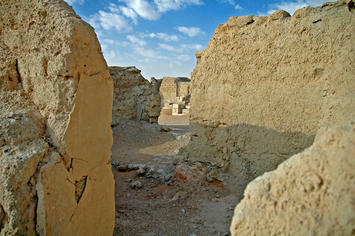 They had found Qaryat al-Fāw, a pre-Islamic city located deep in the deserts of the Arabian Peninsula. When the sand was dug up, the remains of a trading hub bustling with houses, squares, and a large marketplace was discovered. Centuries before the birth of Islam, caravans carrying textiles, minerals, and grains across Arabia had passed through the city. Its inhabitants had worked in trade and agriculture, and relied on seventeen local wells for water. Qaryat al-Fāw is one of many examples of the entrepreneurial culture that existed in Arabia before modern oil-dependency, and its assorted impact on capitalism, set in. The story of capitalism is often told from a narrow Western perspective, yet the first enterprises, the first early banks and the first market based economic model arose 4,000 years ago in ancient Babylonia and Assyria, in the countries we know today as Iraq and Syria. In fact, for much of human history the Middle East embraced economic freedom more fully than the West. The myriad of people who inhabit the Middle East – Iranians, Arabs, Turks, Jews, Armenians and Kurds – have many differences yet are all natural hagglers and dealers, with market exchange encoded in their cultural DNA. This certainly also extends to Saudi Arabia. In ancient Arab societies, many lived as nomads. Yet, trade and enterprise played a key role in the economy. Caravans and ships linked different villages and cities together in complex trading networks. Qaryat al-Fāw resides on the trade route which connects South Arabia with East Arabia and Iraq. The wealth the inhabitants amassed through trade allowed them to commission fine rural paintings and grand statues. High-quality objects such as glass, metal, and ivory were imported from other lands by the rich locals. Its chiefs minted their own coins and had diplomatic contacts with the superpowers of the time, Persia and Byzantium. Centuries later, all of Persia and much of Byzantium was conquered by the Arab armies during the Islamic conquest. Pre-Islamic Persia was the scene of the first socialist revolution (lead by the followers of Mazdak, a zoroastrian priest with proto-socialist views). Paradoxically, this revolution undermined feudal control and allowed for reforms that strengthened private property. This gave birth to a market renaissance. After their conquest, the Arab rulers kept much of the Persian administrative system which helped grow the economy. After the Muslim conquest, a balanced social context developed in the Middle East in which landlords, village notables, merchants, townsmen, legal scholars, military officers and government bureaucrats all held secure positions in society. The ancient Babylonian age returned to the region. The long tradition of commerce and enterprise in the Middle East is often neglected today. Yet in fact, this region gave birth to the concept of enterprise, banking and markets during antiquity. In the early Middle Ages, the region also played an important role in sparking the industrial revolution. When the European market tradition was born in the Italian Renaissance cities, many key market concepts and traditions were imported from the Middle East and improved upon. This includes the tradition of book keeping, the manufacturing tradition that had evolved in the golden age of market growth in the Middle East and advanced farming practices. The Jewish population of Italy, a group which maintained the Middle Eastern tradition of commerce, were instrumental in this development. Much of the economic development in the Middle East occurred in Iraq, Iran, Syria and Turkey but the role of the Arab Peninsula itself should not be neglected. The desert lands of this peninsula are harsh, but the people who lived here did not let that hinder them. They were industrious and produced valuable items for consumption and export. Gaius Aelius Gallus, the Roman Prefect of Egypt who led a Roman expedition to conquer Arabia in 24 B.C., wrote about the entrepreneurial culture of the time. Parts of Arabia were fertile in palm groves and timber, others in agricultural land. Gold mines, bee farms, palm tree oil and aromatic herbs from trees were other sources of wealth. Throughout the centuries, aromatics were one of the main export products of Arabia. Arabs obtained frankincense and myrrh from trees in the form of gum resin. The resin contains a small quantity of volatile oil that gives an aromatic fragrance. Frankincense and myrrh can be used on their own or with a variety of other ingredients to produce perfumes, incense, and even medicines. They were useful for expelling bad odors as well as getting rid of insects. Due to these properties, they were highly desired in homes that could afford them. The production of valuable trade goods was an important source of income to Arab tribes. West Arabia had gold mines, in which gold nuggets were found in abundance in underground galleries. South Arabia possessed silver. The ancient community of Radrad in modern-day Yemen, populated by Persians, had access to flowing water and palm trees. They also had a silver mine, from which enough silver to mint a million coins was mined. The village is said to have had 400 furnaces, creating so much heat that any bird that flew over the village would be roasted. The prophet Muhammad himself was a merchant. At the age of 25, Muhammad married his first wife, Khadijah. She was a rich merchant, and Muhammed had previously managed some of her trade affairs. In much of history, women have been hindered from carrying out trade and enterprise. But Khadijah, a wealthy widow, did not fit in this picture. When the tribe of Quraysh in Mecca gathered their caravans to embark upon the summer journey to Syria or the winter journey to Yemen, Khadija’s caravan equaled the caravans of all other traders of the tribe put together. Today Saudi Arabia is a rich country, yet relies almost exclusively on oil as a source of income. It experienced an industrial revolution many centuries before Europe, but manufactures very little. Saudi Aramco, the national oil and gas company of Saudi Arabia, whose workers stumbled upon the ruins of Qaryat alFāw, is a case in point. Nobody really knows how much the secretive company is worth. According to estimates it could be worth more than ten times as much as Apple, the highest valued company in the US. This gives an indication of the massive economic force that government oil companies in the Middle East carry. These state institutions stand in the way of market progress in the region. The oil of Saudi Arabia is not an infinite resource, and the world is inexorably shifting away from oil due to environmental concerns. Breaking dependency on a single valuable source of income, largely controlled by a state firm, will not be easy. But Saudi Arabia has a chance --- and the capital --- to return to the entrepreneurial culture that served it so well in the past. A market renaissance for the countries of the Middle East might not fit with our contemporary thinking of this region, but would certainly follow a long tradition of enterprise in the region. Photo: Via Our Ancient World.